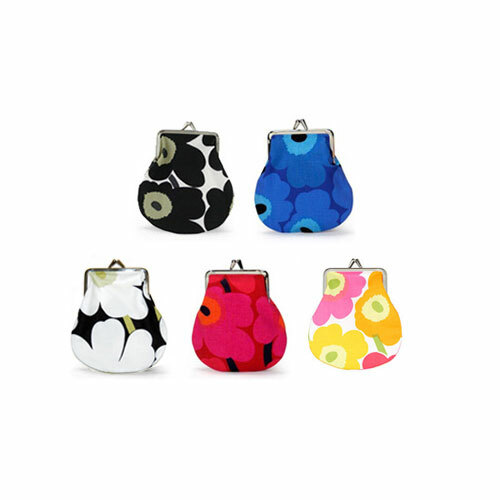 More about Marimekko Unikko Small Coin Purse Keep coinage and spare change safely contained with the poppy-patterned Marimekko Unikko Coin Purses. Made from 100% cotton, these purses feature a strong metal snap closure. 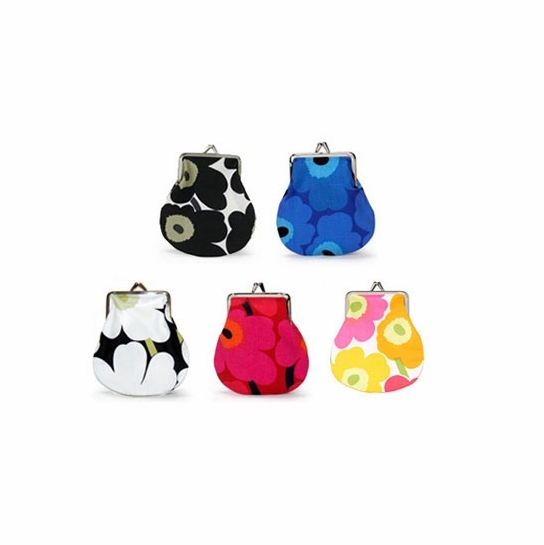 Great for a variety of uses, these small purses are functional and stylishly adorned in a mod floral pattern. I'm constantly looking for loose change at the bottom of my purse. Problem solved with this new small coin purse! I plan to buy more as stocking stuffers/holiday gifts for family/friends. ProsNice quality. Easy to find in large purse. Holds quite a bit of change. It's adorable - and a great addition to my bag. It's so little that I had to cut out the giant tag on the bottom seam The coins hide inside there! It's a perfect size for coins! Cute shape and good size, quality hardware. I was disppointed with the fabric, which I feel is too faded, not bright as I had hoped. I got the small coin purse in the black and it's a nice size for carrying bills folded up as well as coins. However, I'm using it to hold my powder and lipstick as I got the matching mini size for coins. These coin purses are really nice. This mini black coin purse is the perfect size for holding my change for the bus. It's so cute and I love the Marimekko design. Wonderful little coin purse with a gorgeous Marimekko fabric and secure clasp. Loving the coin purse, it is way bigger then I thought and I am now using it as a make up bag. ConsIt is too big for a change purse, but great as a make up bag. Perfect for your spare change, larger than I expected so easy to find in the bottom of your bag! I have bought alot of these purses of varying sizes on my visit to Finland at a much higher price than if you were to get them from this site. Not only are they very cute to look at but they are also very handy. I use the small coin purse to put my , you guessed it, 'coffee' coins in and the purse has lasted for over 3 years now and still going. I gave alot of these as souvenirs to family and friends , not only did they love it, they are actually using it. I use the medium size one to store my iPod and earphones. it keeps them very save !! and the purse is cute to boot. Just right for my purse. Coin purses sold separately or in groups, e.g. is each purse $22.? This is the price per individual purse.